The recent Rubles drop really saved a lot on my travel budget to Russia; and while the weather still freezing cold with occasional flurries at the beginning of April, I finally hopped on the flight to my next destination – to Russia!! We flew from Hong Kong to Moscow. Surprisingly, for a carrier full of Hong Kong Locals, they were just going there for transfer, almost the entire “flight-pool” rushed towards the transfer gate to continue their European quest as we got off from our 10-hour flight, left us the minority that went through the customs for the Moscow journey. For the free tour, Moscow Free tour, which I bet should be very well-known as I saw a big group at the waiting spot in the morning when we arrived. The tour guide did give us an in-depth and interesting introduction of the most important sites and attractions in Moscow around Red Square. We kicked start at a statue in the Varvarka Street, and then we moved on to the Romanovs Chambers, arrived at the Red Square, and then the guide gave a nice narration for the St. Basil’s Cathedral, Lenin Mausoleum, the Senate Palace, and so on. Our journey continued after a short break in GUM the shopping mall and we walked towards the Kazan Cathedral to the Kremlin entrance where the tour ended. All in all, this tour covers a great deal of Moscow classics, and travelers should (like us) definitely explore them one by one afterward! When people were asked why the square was named “Red”, the idea of the red bricks on the Kremlin Wall, the red State Historical Museum, or even communism came up. In fact, the square was named ‘red’ because in Russian, ‘красная’ means either ‘red’ or ‘beautiful’. Of course, how could it not be? The square is entirely surrounded by significant Russian architecture – monuments, Lenin’s Mausoleum, prestigious department store, Saint Basil’s Cathedral, State Historical Museum, and the Kremlin … there were events and concerts held in the square sometimes! Of all the ‘onions’ that existed on earth, I believe Saint Basil’s onions were the most iconic and memorable. Although basil typically tastes the best with tomatoes, the St Basil’s shined with 8 flamboyant onions popping around the tallest church in the center. The uniqueness of its beauty was based on a legend that Ivan the Terrible, the Tsar who ordered the build in 1555, gorged out the architect’s eyes in order to prevent him re-creating the masterpiece elsewhere. Truth to be told, I think even the finest artists would find it impossible to replicate anything like this – it’s like Gaudi couldn’t even finish Sagrada Familia with his whole life, and da Vinci could only paint one Mona Lisa. Now, the cathedral is not a cathedral anymore, it is a museum. 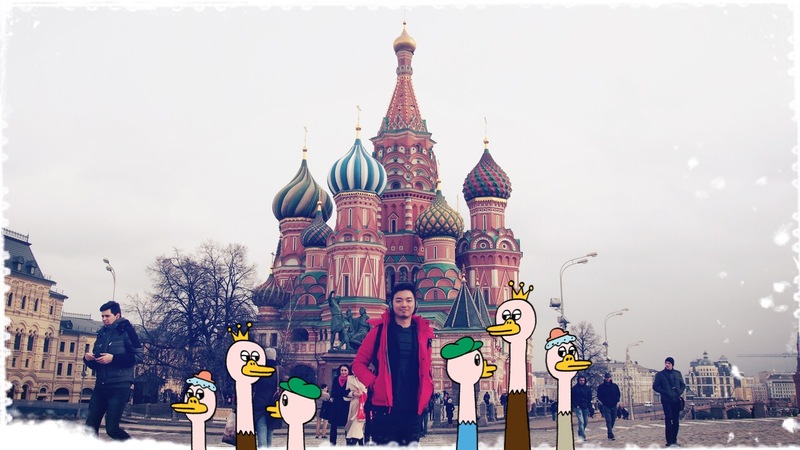 I am not sure if it was the Kremlin or GUM that looked so massive, or it really was true; my first impression of the Saint Basil’s Cathedral was kind of …. tiny. Once I got into the museum it didn’t has a grand hall that most cathedrals had and instead, there were passages that connected us to different rooms of different churches. Each tower is a ‘church’ and technically, there is a total of 9 churches in Saint Basil’s (the churches actually consisted of eight churches around the central core.). Anyway, the small size was made up with amazing frescos and valuable artifact on display. The museum has 2 floors – the ground floor is a foundation of the building and the churches are on the second floor. Interesting, though, the layout of the cathedral was in perfect symmetry – a core in the center, four middle-sized churches built on the four compass points, and other smaller churches diagonally placed between the middle-sized churches. With multiple colors, size, and careful placements, the architectural wonder looks great and different in any angles and distance. Check out more about my favorite cathedrals at My Top 12 Cathedral in Europe (2) ! GUM, (The Russian looks like “rym” to me, all the time), is the department store that located right on the opposite of the Kremlin, and it has been nothing but enlightened the beautiful square. The entire department store is big and it has an impressive interior. The building is in 4 rows, and the staircases connected each row and floor like a maze. We didn’t spend much time shopping around the international brands, but we did have some quality time looking around in the higher-end supermarket on the ground floor, and a café lunch in one of the thousands of cafés in the mall. GUM is outlined with lights like a Moulin Rouge. It looks completely different during the day. The tour guide recommended this place: for cheap & authentic Russian dishes. Getting a data pre-paid sim card in Moscow is easy and cheap! There are two main airports in Moscow, SVO and DME (and as I know DME is actually the bigger one). Anyway, we landed on SVO (Sheremetyevo International Airport) and it has 6 terminals already. Once we got through luggage claim, we spotted money exchange and phone card booths right at the entrance. We told the service people that we wanted pre-paid data cards. We showed our passports and we had local high-speed LTE connection in 5 minutes (for 400 rubles! )It is more than enough for a week in Moscow Instagram-ing, Facebook-ing, google mapping, google translating and lots and lots of web browsing. Note that through Saint Petersburg is in a different data zone and the data rates are different. We had an excursion to Saint Petersburg and our data used up pretty fast. Get a new sim card in Saint Petersburg if necessary. Actually, stores are everywhere and it opens late, we stayed in a hostel and the lady was very nice to show us where to find an ATM machine nearby to recharge our phone cards. Get a new sim card in Saint Petersburg if necessary. Actually, stores are everywhere and it opens late, we stayed in a hostel and the lady was very nice to show us where to find an ATM machine nearby to recharge our phone cards. There are lots of money exchange booths at the airport, and more could be found in the city center or around train stations. The rates fluctuate quite a lot and they are different in and out of check-in zones at the airport. Money exchange places in the city offer a better rate. In general, the exchange rates in Moscow were better than in Saint Petersburg. Get some cash at the airport but look for a better deal in the city later. It’s better to use Euros but those street stores would inspect your dollar bills and they DO NOT accept Euros with any kind of markings or writings on it. Taxi ride in Russia is generally cheap as compared to other western European cities. Don’t forget to negotiate. We used mobile apps to get an idea of the taxi fare to our destinations before hailing a cab. My experience was to start bargaining from half the price the driver offered you (I have also met some pretty honest drivers and didn’t need to bargain, though). Just follow your guts and don’t be afraid to say no. They will usually cave after you close the car door – unless you ask for an unreasonably low price. Language barrier existed. The local service people I met are struggled with speaking English. Sometimes they just say ‘No’ – so be prepared to hear a lot of ‘No’ on the way. Russians are, in my view, actually friendly and willing to help. They just don’t smile. Just be patient, use body language and Google translate, it will be fine in a lot of situations. I have heard a lot of stories about Russian policeman and safety in Moscow. In my experience, it looked the same to me with any typical European cities. I didn’t feel dangerous walking in the streets day or Just take the usual precautions and behave normally you are generally safe. It’s really interesting that most people on your flight flew to Moscow by means of a connecting flight instead of actually visiting. I love that you included a free walking tour as one of the first things to do because I always try to hop on a tour a day or two after I arrive. You learn so much and become familiar with the landscape. I would love to see a round-up post! Moscow is a vibrant and colourful city with an aura and mystique because of the Iron Curtain days. your post brings alive the charm of the place vividly. I find the Red Square magnificent and imposing. Your photos are lovely! And the Red Square at night certainly look like a magical place to visit. I’m not sure if I’ll ever make it to Russia on my travels but I love reading about it and hearing of people’s experiences, like yours!